Great diffused light is a vital part of the extreme macro studio, but finding a decent way to support your diffusion isn't always as straightforward as you might expect. Great diffuser support is as much a part of the extreme macro studio as anything else, as there's nothing worse than trying to make a decent macro stack with the diffusion wobbling. In terms of good extreme macro photography practise during macro stacking, you should strive for constant light on you specimen. Therefore, it is preferred that your diffusion, light and the specimen relative to those should not be moving during the exposure. That said sometimes it's ok to throw the rule books out the window and I've had perfectly good results when directly mounting diffusion on the lens, ie a polystyrene cup shaped so it sits snugly over a microscope objective. A helping hand re purposed from the world of soldering to the world of photography. A cheap and cheerful diffuser holder, but you can of course also use one of these to mount your specimens. A helping hand (or third hand) is an accessory used for soldering, to hold whatever widget that is being soldered. The eBay helping hands have a couple of small metal crocodile clips on adjustable joints that can be pointed in all directions using quite fiddly ball joints, with a small cast-iron base for stability. The deluxe edition also has a magnifying glass. They're pretty handy as a first support and easily sturdy enough to hold a rigid polystyrene cup in place diffusing your specimen whilst you're taking the photo. If the stage that the specimen is on isn't all that big though, then the small cast-iron base can take up excessive room on the stage and make it quite difficult to manoeuvre your specimen without messing up the diffuser position. Also, be aware that these things are made of shiny metal, so you may also find yourself with unwanted reflections or light reflecting where you're not expecting it. All that said they're pretty handy and for the princely sum of £4 you really can't go that far wrong with these. A plamp made from Loc-line modular flexible arm material. The jaws are ferocious and do a great job at attaching the thing to a tripod for use outside. Loc-line plamps are very useful to hold reflectors as well. Loc-line modular hose is the type of flexible arm material that you typically find on gorillapod type mini tripods, a flexible ball and socket type arm material that can be extended or twisted into whatever length or direction you want. Together with a few plastic crocodile clamps, they make an excellent and sturdy way to hold your diffusion material draped over the specimen. They can also be used in the field to keep things from swaying in the wind, and Loc-line is a product well worth looking at for diy photography accessories. Wimberley sells custom versions of these as plamps but in fact they're just bits of loc-line with clamp heads. Noga friction arm, the Rolls Royce of friction arms that are available commercially. These cost a three-figure sum, but provide the most secure hold of all the commonly used arm brands including Zeiss and Manfrotto. eBay arms which sag cost as little as £15, but you get what you pay. 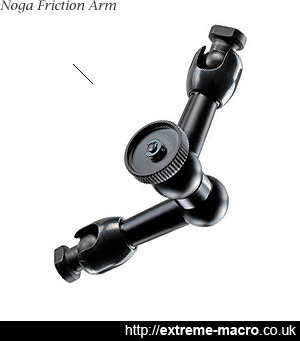 Manfrotto or Noga arms are the highest quality but they're also the most expensive. Manfrotto hydrostatic arms come in for a lot of praise, locking rigidly in place. Cheap and cheerful eBay arms sag a little but only cost £15, and I do have one which I use to hold a UV light source for fluoresence photography. Ebay arms have been reported to sag a little but they're more than usable if you are on a budget. You'll need to figure out a way of adding a clamp unit onto the arm, though.